The flowers are fine, large, well formed, sweet scented double borne profusely on long runners from well-rounded bushes. Colors range from brilliant red to orange, maroon and cream yellow. Plants are semi-trailing. 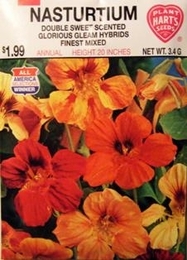 This All American Selections Winner Nasturtium is easily grown in any soil and blooms profusely for a long period. Nasturtiums require little water and no fertilizer as enriched soil tends to produce more foliage than flowers.